Over the past few months, at least three militants from Srinagar, gunned down by security forces, were found to be affiliated with the Islamic State. The summer capital of Jammu and Kashmir, Srinagar, until recently was largely dormant in terms of the revival of new-age militancy that gripped parts of the Valley. Of late, however, things have begun to change with the city emerging as a major threat on the map of global terror networks. 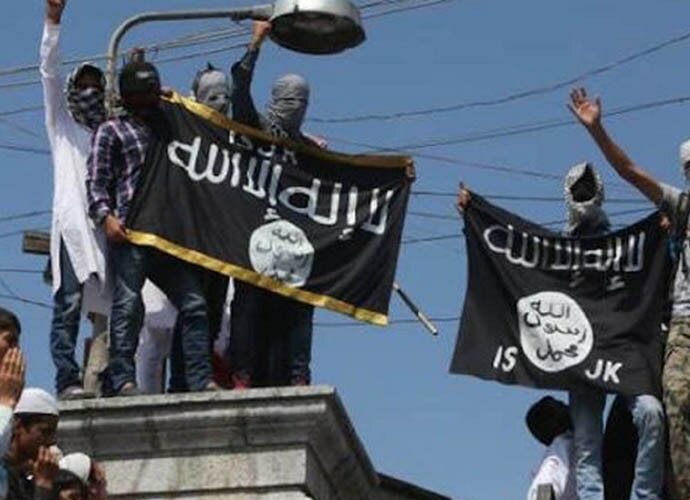 Unlike the rural areas, especially south Kashmir, which gradually emerged as a hotbed of new-age militancy backed mainly by Pakistan, the urban hub is suddenly turning into a breeding ground for the Islamic State. Mind it, militancy in Srinagar is not about numbers. The number of youth who picked up arms in the city is far less than those is districts such as the restive Anantnag, Pulwama and Shopian, where over 200 militants are active. Their number is rising despite a major military offensive to eliminate them. But the recent threat perception from Srinagar looks the gravest. Over the past few months, at least three militants from Srinagar, gunned down by security forces, were found to be affiliated with the Islamic State. This figure is the highest for any district in the restive state. On June 23, 2018, the killing of Islamic State JK chief Dawood Sofi alias Dawood Salafi along with three of his associates in an encounter in south Kashmir was seen as a severe blow to the outfit, which surfaced on the militancy map of Kashmir two years ago. An alumnus of the famous Burn Hall School in the urban hub, Dawood, who hailed from HMT area of Srinagar, had picked up arms in November 2015 to join Pakistan-based Tehreek-ul-Mujahideen (TuM). It was a time when the outfit had reared its head again after remaining dormant for a few years under the command of Mugees Ahmad Mir, who also hailed from same HMT locality on the Srinagar-Muzaffarabad highway. Dawood took over as the TuM chief after the killing of Mugees in a police shootout on November 17, 2017. The first signs of TuM's links with Islamic State appeared in April 2016 when Mugeess and Dawood, the two urban ultras, surfaced at the funeral of a cop-turned-militant Naseer Ahmad Pandit in Pulwama. Mugees and Dawood asked the mourners at the funeral not to hoist Pakistani flags but black flags of "Tawheed", the Arabic word for oneness of god. Interestingly, unfazed by such commandments, a section in south Kashmir continued to be driven by support for azadi or Pakistan at most of the funerals of slain militants. In some cases, the besieged militants had requested that they should not be linked to the IS as their last wish. According to a news report in Deccan Herald, on March 31 moments before being killed in an encounter, wanted militant Rouf Khanday, had called up his family saying if he dies, mourners should be asked to not raise any pro-Islamic State slogans at his funeral. Srinagar, however, proved different. Apart from covering bodies of militants in the black flag, the IS supporters literally abused India and neighbouring Pakistan, alike. Things turned uglier in the spring of 2018. On March 12, at the funeral of Eisa Fazili, an engineering student-turned-militant, there was an unusual show of support for the IS. A Burn Hall School alumnus, Fazili was one of the three militants, including one from the southern state of Telangana, who were killed during a gunfight with security forces in south Kashmir. According to the police, Eisa belonged to TuM. But after joining the outfit in 2017, one of his photos, which went viral, showed him wearing a T-shirt bearing the IS emblem. When Eisa's body reached his house in Soura locality of Srinagar, a group of over a dozen masked youths, including girls, stormed into his ancestral house. Holding IS banners and shouting slogans in support of its Syrian chief Abu Bakr Al Baghdadi, as well as Kashmiri militant Zakir Musa, who has already threatened to behead Hurriyat leaders, the group forced their way into the house of the grieving family and tried to take away his body. Barely an hour after his funeral, a 14-minute video from IS surfaced on social media. The video message apart from paying tributes to Fazili and his colleagues, threatened top Hurriyat leaders, including veteran separatist leader Syed Ali Geelani, accusing them of being "agents" of India or Pakistan and "enemies of the IS". The news about Islamic State support for Eisa Fazili spread like wildfire but only to dishearten the larger population. Many youths, who had taken to streets to protest against the killing, silently returned home as none wanted to support the IS ideology. Call it coincidence or strategic reaction, within a week of the Hurriyat bashing by IS supporters, Geelani resigned from the chairmanship of Tehreek-e-Hurriyat, a position he had held since its inception on August 7, 2004, after a split in the then united Hurriyat. But then, what connects TuM to the IS? Well, as per a news report in Srinagar-based Greater Kashmir, during 1990s, the militant outfit had remained active by drawing cadres, mainly from the Saudi-based Salafi school of thought, propagated in the Valley by the Jamiat e Ahle Hadith. The Jamiat e Ahle Hadith is different from Jamaat-e-Islami, founded by prominent Pakistani scholar Syed Abul A'la Maududi Chishti. The JK chapter of Jamaat-e-Islami has long been seen as a supporter of the pro-Pakistan outfits like Hizbul Mujahideen. Jamiat Ahli Hadith, on the other hand, claims to be a non-political religious organisation, registered way back in 1958 as a society. "With its functional offices in every nook and corner of the state, the organisation has a total membership of around 15 lakh people, with more than 700 mosques and 125 schools of different levels," the Jamiat says. Interestingly, the previous PDP-BJP coalition in the state is accused of having showered more incentives on the Jamiat than Jamaat, which was PDP's "favourite" during its maiden stint in 2002. As per news reports, apart from giving Jamiat supporters top chairs in bureaucracy, a major chunk of famous Narkara wetland, a home to migratory birds in Srinagar, has been gifted to the religious group for establishment of Saudi-backed Trans World Muslim University. Coming back to the IS, critical of both India and Pakistan policies, the terror outfit has been publicly criticising Pakistan-based militant outfits like Hizbul Mujahideen, Al Badr, Lashkar-e-Toiba, Harkat ul Mujahideen and Jaish-e -Muhama as being "puppets of Pakistan and its agencies." While the common people and even the separatist reject the IS ideology, the terror group continues to find some support in Srinagar. 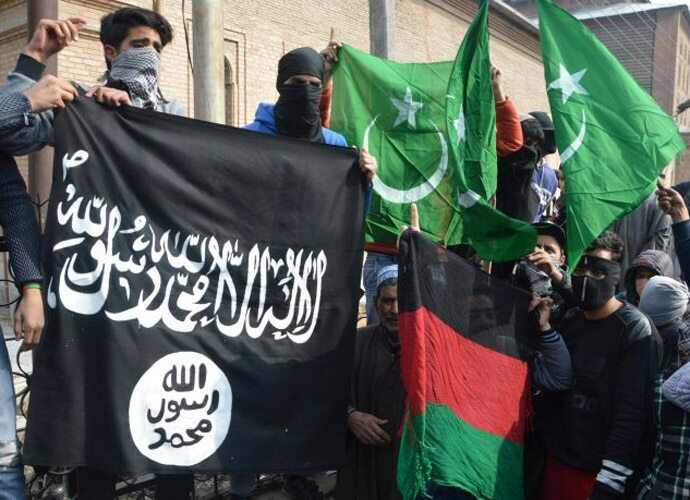 As per police, the IS flags first appeared in Kashmir in 2014, near Jamia Masjid in Srinagar, a stronghold of senior separatist Mirwaiz Umar Farooq when the cleric delivers Friday sermons from the pulpit. Despite his appeals, IS flags continue to haunt his bastion. In Srinagar, even body of pro-Pakistan militants is wrapped in IS flag. On June 14, 2017, the body of Sajad Gilkar, a Hizb militant who hailed from congested Nowhatta, killed in Budgam, was wrapped in the Islamic State flag. While New Delhi upholds the tricolour to fight infiltration of Pakistani green, Srinagar is shifting towards Islamic State's black.